My friend has a BEAUTIFUL S&W Model 52-2. After I shot that 98 slow last week, he asked me to try it out and see if what I could do with his gun. First shot felt good, and it took the 10 off the paper. The next 4 were all in there too. Threw that 7 and 8 in there, then settled down and drilled the last 3. My friend asked me why I haven't bought a 52 for CF yet! I told him that I had never shot a .38spl auto and didn't realize how easy it was to shoot them well. I shot 3 more targets--all worse than the one before. My friend asked what the hell happened. I told him "new gun syndrome". When the subconscious wants you to see what the gun can do, and you get the extra focus on the front sight, you apply all the fundamentals, and you follow through. Sorry you missed the point. And you seem a little sensitive when someone disagrees with your perspective as well. I though we were having a discussion about shooting and getting better. Sorry you don't think some people can. I prefer to believe different, stated so and disagreed. Let me be clear, I think most people have the physical potential to shoot at least Master level. This ain't pro ball. If they can't get there I think its mostly because they are stuck at whatever level they choose to "practice at", "limit to through vision or equipment" or "believe". If they decide to believe something different and train, they might find its Master level too. Personally, I think it is better to think about how it can be done rather than just saying everyone has a ceiling at whatever level they are at. I've known people that move up to Master just because they finally figured out that they need different glasses. And you don't have to shoot a ton of matches either. Again, it ain't quantity, its quality. Again, I see most people sending too many rounds down range doing exactly the same thing again and again and thinking repetition will make them better. Again, my point, if your group is not changing then we need to change how we are doing it. As you said the Marksman "practiced" twice a week. Then he got exactlly what he practiced. If you keep getting the same results, why would you keep doing the same thing. I did not expound on any specific training principles except learn the fundamentals, dryfire with a purpose, and see what you need to see. You want to know my "training program"? Think, See and quit throwing rounds down range without a specific training purpose for each one. I'll bet every one of your limited shooters fires a shot outside the black and then spends some time thinking about what went wrong. We need to quit studying bad and spend ten times as much time studying what went right went when we shoot a 10. I would be interested in knowing why one would still shoot without the expectation to get better? Bullseye is not fun? If we ain't having fun, then why bother? Last part of training, talk to someone better. Did anybody ever ask those same 2 people that win each time what they do, what they see, what they think? Of couse, not everything will work for everyone. But to give up the chance to ask and see if something comes of it? What a waste! We don't know what that real ceiling is until we punch through the one in our heads. Or put it this way, did anyone ever make the best time over an obstacle course on the first run through or by themselves. No, people get their best times by being challenged, having someone watching, helping train and pushing them for that last bit of extra effort. And finally, simply stating that this is something to "fight" about probably explains a lot about limits, thinking and shooting ability. Really, that's the way we're supposed to learn? Best of luck to you and I hope you find a way to improve. By the way, I once had a lady that visited our match who wanted to try shooting a bullseye gun. I gave her a dot sight .45 and helped her fire 10 shots at 50 yards. Slowly and with no expectations, wearing 2 inch heel boots, she listed to the instructions, dryfired and then dryfired on the target a few times. Then she put in plugs and ear muffs, and proceeded to fire 5 rounds. I coached a little for each shot, mostly getting position right and grip strength. I reloaded and she fired 5 more. One shot in the white, the rest in black and scored a 90. She decided to take up bullseye for a while, with her boyfriend "helping" her. Eventually her boyfried took a perfectly great potential shooter and "coached" her to the point she acould barely shoot Marksman scores and then quit. To awnser Robs original post about new gun syndrome is Cecil's post about expectations. When you shot the new gun you had no expectations. You just shot. When it is time for a match that is what you need to do just shoot. Rob Kovach wrote: What is "CRS"? Sensitive? I don't think so. The fact that everyone seems to be piling up on me, seems to be that I hit a nerve somewhere. I've had more than enough success shooting in these last 25years to come to my own conclusions. Bullseye isn't the only thing i shoot. The last time I checked we live in America and we all have our own theories and conclusions. Obviously, you don't agree with mine and thats fine. I think the notion of "either you have it or you don't" is exactly what this discussion is about. If you were to analyze my shooting in competition, you would have to catagorize me as someone who "doesn't have it". Cecil, thanks I think you just helped me get back on track. My AP training and practice had become routine and I had stopped using my performance journal because I was shooting well and had figured it out. I was no longer "Training With Purpose" (Bassham - Mental Management) and my scores had plateaued. What I have been doing to get me to my current level (545-560) with the AP is not what I need to do to break through to the next level. I have some very aggressive goals one of which is making Master by Perry 2014. My first shot with an AP was 7 months ago and my first exposure to bullseye was during a clinic 8 months ago, I'm 60 and newly retired so I have the time and the passion. Train hard and enjoy the match. and yes I have picked up a gun I have never shot before and shot a personal best with it. I talk to experts and marksmen all the time being one,and from time to time i learn something, when someone has reached high master or shot above 2600 and are willing to talk about how they achieved that realm of success, I feel honored they are willing to share with me. Thanks Cecil and the others for your posts. 2. Self-limiting narratives are just that. 3. Be brutally honest with yourself (not the same as being brutal to yourself). 4. See what you need to see. 5. Expectations are a b*tch. Coming from the practical pistol side of competition, I can say all these concepts are well-established and there's not a single Master+ shooter I know there who'd disagree with any of them and/or haven't embraced them themselves. Conversely, I know quite a few stuck in Expert Perdition who'd argue with nearly every point, or say they don't apply to them. Notice a trend? As a revolver shooter, I've noted that revolver shooters, in particular, are susceptible to the dreaded self-limiting Revolver Narrative - that "everything's sooooo hard because I shoot a revolver". Without even being aware of it, many have defeated themselves before they've even shot because they've given themselves permission to underperform. In retrospect, I was fortunate enough to start competing ignorant of any idea that revolver shooters were "supposed" to be handicapped and slow. My revolver was simply my gun, and I just shot and let the results take care of themselves. As a result, I went from Novice to Master in about a year, and am now knocking on the door of "High" Master and possibly a national title, with some nice big wins along the way. I didn't see that Cecil ever said or suggested everyone can be a High Master if they just wanted it bad enough, but rather that we usually have abilities beyond what we think we have. Whether that ability is Expert, Master or HM doesn't really matter. What does matter is a fruitful journey to that potential, and our own mental traps can easily be the biggest impediment to your goal. Rob, no, I have never experienced "the new gun syndrome". I am glad you have. Shooting another person's pistol is tough for me. Sights or dots are are adjusted to their eyes and not to my eyes so shots can be grouped but not where I want them. Cecil, excellent comments.I will take some time to read them really closely again later. I had a "new gun" experience a few years ago. I found a deal I could not refuse at a local collector club show. It was on Father's Day and the brand new Beretta 92FS was the Father's Day Special for 400 bucks. I then found a box of Win White Box and went straight out to the range 20 miles from my home. I set up a 50 yard target and found with only a couple shots the fixed sights were off a bit for a -6oc hold. And the trigger was nothing to write home about. I figured a center hold might be better for now. I usually do not do center hold. Even with the groups center at 2oc in the 9 ring, I managed a 90. Doing the center hold with the atrocious trigger was requiring a new approach that I wish I could find every time out to the range and at every match. Unfortunately, new gun syndrome goes away quite fast. As we can see in reading the several posts in this thread "new gun experiences" shooting worse than average is usually tipped off by the "reasons" they offer, sights, different, trigger pull, grip, etc. Did those "reasons" plant lower expectations? Better results are usually obtained when the shooter decides that the only way to overcome the "reasons", if they exist, are to say " I can only control what I do so I'll just concentrate on the sights and the trigger, which I can control. Some time ago after an illness caused me extreme shortness of breath & weakness I returned to shooting and after a couple of times out w/ the .22 and scores I don't recall I decided to try the .45. I felt as above "all I can do is accept my hold & squeeze the trigger". I shot a 290, not a terrific score, but would have been a nice average. Pistol shooting is a mind game. Those who pay attention to fundamentals from the start are the "naturals". Look at the 5 reasons above. They and Cecil's very good instructions are coaching. Concentrating on the front sight and trigger control is what we do (attempt) when we shoot. Cecil is telling us (how) to do it. If one takes the firing line saying "well so and so are here and will outshoot me or I'll probably just shoot another darn 85 SF or blow RF or the last match I shot 20 points over my avg so I'm due for a bad one", what will the results be? Here's another thought, try going to sleep every night visualizing that perfect shot we've all had, trigger break, recoil and all those details. I've experienced "new gun syndrome" several times with the same results each time: my score much higher than my average. When I shoot a gun I haven't shot before or in a long while my scores go up significantly. 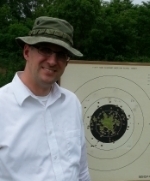 I remember shooting my 22/45 for the first time in a match and I shot an 855 in an outdoor match, 860 next time. I usually shoot 830's. Thereafter I was back to 830s. After doing trigger work on one of my Marvel frames (roll trigger) I shot 20 points higher then my average. Then back to my average. I attribute it to not being familiar with the trigger in each case, not knowing how the trigger feels seems to "prevent" anticipation. Can't consciously or sub-consciously know when the trigger is going to break so don't have the time to jerk the shot into the white. I experienced this with the wad guns also and thought about it long before I ever heard of "new gun syndrome". In every case my scores reverted back to my average after the first or second match with the new gun or trigger work.